3-D movies like Monsters vs. Aliens hurt your eyes. They always have, and they always will. It hurts your eyes. Always has, always will. One week into its theatrical run, Monsters vs. Aliens has already become a certified, three-dimensional mega-blockbuster. In its opening weekend, the film crushed previous records by pulling in $33 million in revenue from RealD and IMAX screens and $59 million total; with little competition at the box office, there’s every reason to think it will become the highest-grossing 3-D movie of all time. The timing couldn’t be better for the evangelizing studio executives who plan to release 40 more films in the format over the next few years. At an industry trade show this week in Las Vegas, Fox studio Co-Chairman Jim Gianopulos called 3-D “the most exciting new exhibition technology since they put sprocket holes in celluloid.” Jeffrey Katzenberg, whose DreamWorks Animation studio produced Monsters vs. Aliens, predicts that soon enough all movies will be made in 3-D and audience-members will bring their own pairs of polarized spectacles to the theater. Let me go on record with this now, while the 3-D bubble is still inflating: Katzenberg, Quittner, and all the rest of them are wrong about three-dimensional film—wrong, wrong, wrong. I’ve seen just about every narrative movie in the current 3-D crop, and every single one has caused me some degree of discomfort—ranging from minor eye soreness (Coraline) to intense nausea (My Bloody Valentine). The egregious side effects of stereo viewing may well have been diminished over the past few decades (wait, does anyone really remember how bad they were in 1983?) but they have not been eliminated. As much as it pains me to say this—I love 3-D, I really do—these films are unpleasant to watch. That’s because the much-touted digital technology is not fundamentally different from anything that’s been used in the past. Today’s films, like those of yore, are made by recording and projecting a separate pair of image-tracks for each eye. These are slightly offset from each other, giving what’s called a binocular disparity cue, which in turn produces an illusion of depth. 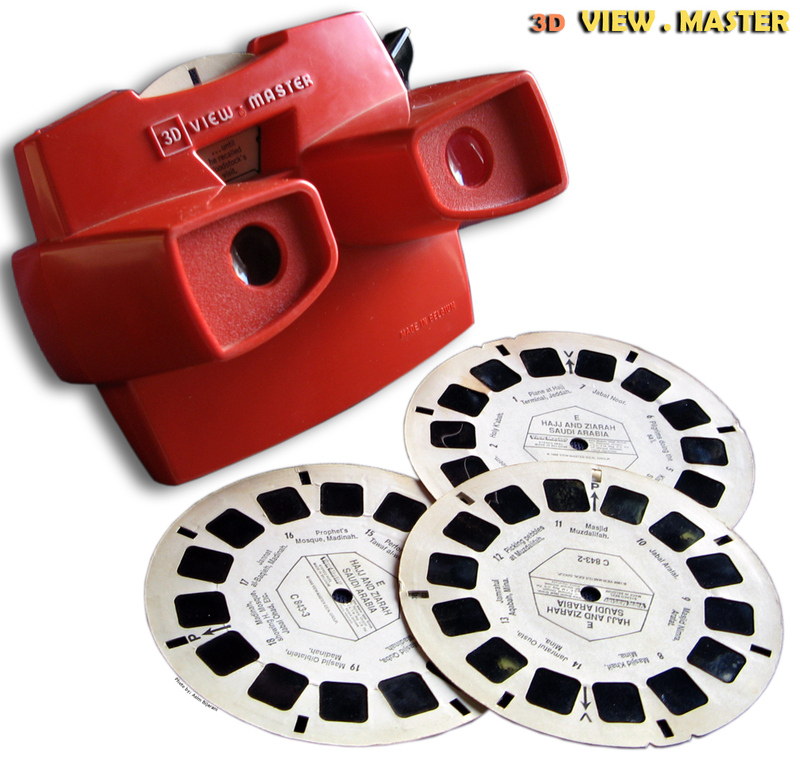 (It’s the same idea as an old View-Master, or an even older stereoscope.) For at least the past 50 years, and across several theatrical revivals, 3-D filmmakers have used the same technique for separating the two tracks: They project the footage for each eye through lenses of different polarizations for an audience wearing polarized glasses with matching filters. (Despite frequent claims to the contrary, the 3-D films of yesteryear were rarely shown in anaglyph with those schlocky red-cyan glasses.) Whatever breakthroughs we’ve seen in 3-D technology have been relative refinements of the same technology. The essential mechanics of the medium—and its essential side effects—haven’t changed at all. Vision researchers have spent many years studying the discomfort associated with watching stereoscopic movies. Similar problems plague flight simulators, head-mounted virtual-reality displays, and many other applications of 3-D technology. There’s even a standard means of assessing 3-D fatigue in the lab: The “simulator sickness questionnaire” rates subjects on their experience of 16 common symptoms—including fatigue, headache, eyestrain, nausea, blurred vision, sweating, and increased salivation. (Japanese scientists use a native term, shoboshobo, to describe the “bleary eyes” that sometimes afflict 3-D viewers.) Despite all this work, no one yet knows exactly what causes this visual fatigue, or “asthenopia“; in any case, there’s little reason to think it can ever be overcome. One potential explanation for the discomfort lies with the unnatural eye movements stereoscopy elicits from viewers. Outside of the 3-D movie theater, our eyes move in two distinct ways when we see something move toward us: First, our eyeballs rotate inward towards the nose (the closer the target comes, the more cross-eyed we get); second, we squeeze the lenses in our eyes to change their shape and keep the target in focus (as you would with a camera). Those two eye movements—called “vergence” and “accommodation”—are automatic in everyday life, and they go hand-in-hand. Something different happens when you’re viewing three-dimensional motion projected onto a flat surface. When a helicopter flies off the screen in Monsters vs. Aliens, our eyeballs rotate inward to follow it, as they would in the real world. Reflexively, our eyes want to make a corresponding change in shape, to shift their plane of focus. If that happened, though, we’d be focusing our eyes somewhere in front of the screen, and the movie itself (which is, after all, projected on the screen) would go a little blurry. So we end up making one eye movement but not the other; the illusion forces our eyes to converge without accommodating. (In fact, our eye movements seem to oscillate between their natural inclination and the artificial state demanded by the film.) This inevitable decoupling, spread over 90 minutes in the theater, may well be the cause of 3-D eyestrain. There’s nothing new about the idea—an article published in the Atlantic in 1953 refers to the breakdown of the accommodation-convergence ratio as a “difficulty [that] is inherent to the medium.” And there’s no reason to expect that newfangled RealD technology will solve this basic problem of biomechanics. The eye-movement issue may even carry other, more serious risks. A long session of 3-D viewing tends to cause an adaptive response in the oculomotor system, temporarily changing the relationship between accommodation and convergence. That is to say, audience-members may experience very mild, short-term vision impairment after a movie ends. I won’t pretend there’s any hard evidence that these transient effects could develop into permanent problems. But if 3-D becomes as widespread as some in the industry claim—every movie in three dimensions, for example, and television programs, too—we’ll no doubt have plenty of data: Small children, their vision systems still in development, could one day be digesting five or six hours of stereo entertainment per day. There’s already been one published case study, from the late-1980s, of a 5-year-old child in Japan who became permanently cross-eyed after viewing an anaglyph 3-D movie at a theater. There are plenty of other problems with 3-D movies that might contribute to the sore eyes, headaches, and nausea. As a general rule, the greater the disparity between the two image tracks—that is to say, the farther apart the two cameras are placed during shooting—the greater the illusion of depth in the finished product. That’s a plus for the filmmakers, who tend to favor extreme special effects, pickaxes flying off the screen and all that. On the other hand, the more pronounced the disparity, the more difficult it is for the viewer to fuse the two perspectives into a coherent scene. That could lead to double-vision, uncomfortable flickering, and—yes—eyestrain. So here’s one theory for why 3-D movies have failed to catch on in the past. It’s not because the glasses were “cheesy” or because the projection systems were crude. It’s not because the movies were poorly made. (Some truly amazing stereo films have been produced, like Hitchcock’s Dial M for Murder.) No, the bubbles always pop because 3-D movies hurt our eyes. We may not notice the discomfort at first, when the gimmicks are still fresh and distracting. But eventually, inevitably, perhaps unconsciously, they creep off the screen and into our minds. It’s happened before and it will happen again: At some point soon, 3-D cinema will regain its well-earned status as a sublime and ridiculous headache.